Website log files are getting bigger and bigger as the website runs day by day, it may cause errors. I will show you how to remove log files in Plesk. Main website log files (access_log, error_log) should be cleared with the following command, removing main log files may possibly lead to incorrect functionality of Apache and nginx. access_log. This log records all HTTP requests processed by the web server. access_ssl_log. This log records all HTTPS requests processed by the web server. error_log. This log contains diagnostic information. It also records any errors that the web server encounters in processing requests. proxy_access_log. This log records all HTTP requests processed by the proxy web server. proxy_access_ssl_log. This log records all HTTPS requests processed by the proxy web server. proxy_error_log. This log contains diagnostic information. It also records any errors that the proxy web server encounters in processing requests. MediaTemple just shared a couple code of 45% off for the first year for Grid service or DV plans, the coupon code will be validated on November 20 and 21 only. Use coupon code SECRET45 at checkout. If you interested in this offer, please read the following limits first and get a whole picture of this offer. Offer valid for new annual hosting services purchased through the Media Temple website or sales department between November 20, 2017 at 12:01am and November 21, 2017 at 11:59pm PST, using an applicable promo code. Offer applies to the initial purchase of Grid Personal, Grid Pro, Grid Elite, DV Developer Levels 1-6, and DV Managed Levels 1-6 and applies to annual plans only. The discount will be applied to the already reduced annual introductory price for a total of 45% off. Subsequent years will be billed at full price. Dreamhost rejected to provide the information of disruptj20.org, which was requested by the Department of Justices. Here is a list of blog posts or news reports about this issue. This is a blog post from official Dreamhost Blog and been updated regularly when there is something new about this issue. Godaddy, which is a leading company in domain registration and web hosting, announced the acquisition of Sucuri. Both Godaddy and Sucuri have published the announcements on their own blogs. It’s really a good news for their customers. There are plenty of programs and web hosting companies, it’s only takes several minutes to set up a website. However, protecting our websites from cyber attacks is not easy even if we know basic knowledges and have done some security optimizations to our websites. I can’t wait to see how will Godaddy integrate Sucuri’s services into existing products, and what benefits will this acquisition will bring to us. Vultr announced $2.5 per month plan about a week ago, and I was wondering how the performance is for such a low price. Here is a basic performance test of this VPS hosting plan, including hardware basic information, I/O test, network speed test and unixbench test. Before showing test results, I would like to declare that the results may variable in different data center regions or on different server node. Even in the same server node, it may affected by other users, especially bad-neighbors and the test results variable from time to time. I was using a shell script from bench.sh, this test will show you the basic information of the VPS environment, I/O results and network speed results. From the screenshot below, I found the network connection is a 1Gbps port at least, which was not disclosed on pricing page. From the above test, we only see a brief information about CPU and memory, we can use linux command to get the detailed information about CPU and memory. Here is a screenshot of running the command cat /proc/cpuinfo. Here is a screenshot of running the command of cat /proc/meminfo. Unixbench is a popular server benchmarking tool. The results will depend not only on hardware, but on operating system, libraries, and even compiler. We don’t need to understand the complex algorithm inside the program, we just need to know whether the index scores is more than 1000. If it is, the performance is not bad. Vultr’s final index scores is 1337, and the performance is not bad. According to the above test results, Vultr’s $2.5 plan is worth buying. The test results is better than I expected. Several hours later, I deployed another $5 plan instance, and the benchmark results are more or less the same even though the price is doubled. Reduce resource usage of instance, because package filtering takes place at a higher level on the network. Vultr firewall is managed through the Vultr control panel, it’s much more straightforward than Linux built-in firewall service which is configured in command line interface. Vultr firewall group can be applied to multiple instances, really a time-saver. Vultr firewall is flexible and easy to use. First, create a firewall group. Second, add desired rules to firewall group. Third, apply a firewall group to a server. Before you apply firewall to instances, you should know the differences between Vultr Firewall and Vultr DDOS protection service. Vultr Firewall is designed to enhance the security while DDOS protection is designed to block large volumes of traffic based on proprietary detection algorithms. Vultr Firewall may a little helpful in certain circumstances, because it can be used to block certain IP protocols or source IPs by rules. It’s time to stop system built-in firewall and enjoy the convenience of Vultr web-based firewall service. 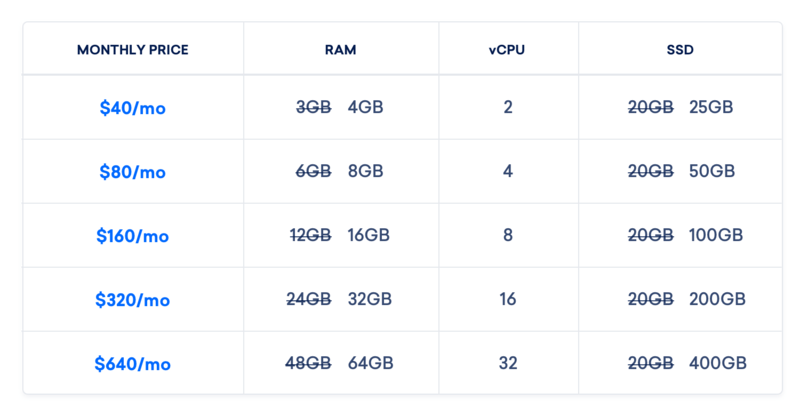 Vultr just upgraded all plans and announced a $2.5 per month plan, which comes with 1 CPU core, 512MB of memory, 20GB of SSD storage and 500GB of data transfer. Will you agree with me that Vultr is fighting back Linode which upgraded their plans two weeks ago. How to upgrade for existing customers? Please navigate to settings–>change plan and select the right plan, please note that downgrade is not supported. Here is a screenshot of how to upgrade plan. Cloudflare published a blog post of incident happened recently. If you are using, or used to be Cloudflare’s clients, you should pay attention to official announcements and change your administrator passwords and customer passwords if necessary. This bug was founded by Tavis Ormandy who is from Google Project Zero. According to official blog, in some unusual circumstances, Cloudflare’s edge servers were running past the end of a buffer and returning memory that contained private information such as HTTP cookies, authentication tokens, HTTP POST bodies, and other sensitive data. And the most important is some of that data had been cached by search engines. Before the announcement, Cloudflare team has worked out with search engines to scrub the caches. Cloudflare has not provided an official list of affected domains, here is an unofficial list of domains may have been affected. As i said, it is unofficial, and not all the domains in the list have been compromised, otherwise, the domains have been compromised may not in the list. Let’s focus on the incident and stay tuned to official solution of solving this incident.